By now I’ve made it pretty clear that I hold my son in high regard. I think Simon is sweet, smart, and a surprisingly good athlete. I’ve copped to his being a picky eater and non-awesome artist, but many of my posts focus on his strengths. This isn’t one of them. Because good grief the boy can’t work a puzzle. His puzzle ineptness is epic. If you evaluated him based on ability to put together a puzzle, you’d send him back to the toddler room. It’s almost amazing. A week ago, we began work on a geography puzzle. His first instinct was to complain that it “only” had a hundred pieces. His second instinct was to try to put two pieces together: one yellow and one pink; one with writing on the horizontal and the other with writing on the perpendicular. So he did. For about two minutes. After successfully putting pieces together where both fit into the same country or continent, I handed him a corner piece. Which he promptly tried to put in the middle of the puzzle. “Simon! Does that look like a place a corner piece could go?” I asked. “Yeah!” came the reply. I might have liked it better when he quit. And so it went. Eventually we put the puzzle together (whoever says there’s no “I” in “we” got that one wrong!) without coming to blows or tears. Simon even learned a little from it and got better. But it was tough going for sure. The other domain at which he stinks? Climbing. I blame Matt for this one. When we were in our twenties in Ann Arbor, circumstances found us needing to hop a fence. * I scrambled over quickly, only to turn around and see Matt stuck at the top. Really stuck. He got down eventually—we did marry, move across the country and back, and have a child—but for a while there in the early ’90s I was worried he’d grow old atop a 5-foot piece of chain-link. 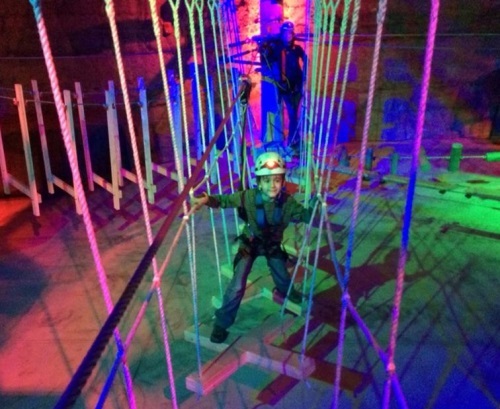 Last Thursday we headed to the Louisville Mega Cavern ropes course with Simon and my nephew Ben. Like Simon, Ben is smart, particularly good at math, and a gifted athlete who loves watching America Ninja Warrior. Unlike Simon, Ben is a natural climber, possessed of strength, agility, and total fearlessness. Whereas Simon, bless his heart, is all tangled feet and elbows when he goes to climb, is underpowered in the upper body, and is scared to be more than about six inches above ground. My mom and Matt are both acrophobes, so this isn’t surprising. We got off to a disastrous start at the ropes course, choosing a path that required us to climb a steep ladder and reclip our lines about four times while ascending. Things escalated from bad, “I’m scared!”, to worse, loud sobbing, quickly. I took over at that point, holding on to Simon and clipping and re-clipping both our lines while we descended. There’s nothing like being terrified (Simon) and sweaty from exertion (me) before officially getting started. From this point onwards, we chose the low route. And even then, there were times when Simon was shaky: like on a section where you climb between wiggly logs. He was too short to reach all the holds and terrified of falling . . . six inches down, while wearing a harness. Ben, meanwhile, was climbing, hanging, and zip-lining away on the level above our heads. Say this for the boy, he knows his limits. *I know this sounds nefarious, but I think we were just trying to get to our car without walking very far after getting lost and walking and circles. I’m sure we could have been busted for trespassing, but we weren’t up to anything bad.